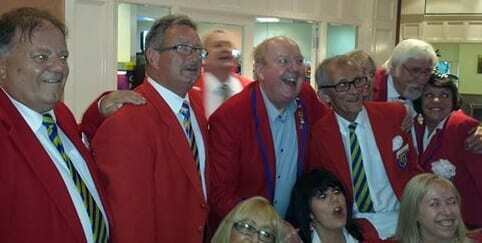 Jimmy Cricket had his latest Butlins Redcoat reunion when he was appearing at a Pontins holiday village earlier this summer. The well-known comedian worked as a Redcoat at the Butlins sites in Clacton-on-Sea, Essex, and Mosney near Dublin in Ireland during the late 1960s before becoming a household name on television. He has met up with some of his old colleagues during the decades since then and this was actually the second time he had encountered this particular group of fellow former Redcoats – he also bumped into them the last time he was at Sand Bay Holiday Park in Weston-super-Mare, Somerset, a couple of years ago! The photos are courtesy of Paul Ogden, with whom Jimmy can be seen right. Above, Jimmy has actually managed to borrow a red coat from one of the group and is pictured alongside them all sharing some comedy banter. * Redcoat is the name given to front-line staff at Butlins holiday camps in the UK. A Redcoat has duties ranging from adult entertainer or children’s entertainer to stewarding. Read more about them here.